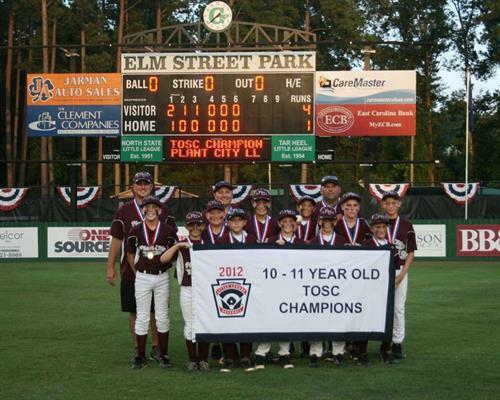 Little League Baseball is a long standing tradition in Greenville. North State Little League began play in 1951 while the Tar Heel Little League began playing three years later in 1954. Greenville Little Leagues currently has 16 major league teams (9-12 year olds). Eight of these teams play in the North State League and eight of the teams play in the Tar Heel League. There is also a Minor League which began play in 1989 for children who do not make a Major League team. The Greenie League for 5-8 year old children began play in 2009. The Greenie League replaced the longstanding Big Fry-Small Fry program. The Greenie League features some games played on regular Little League fields along with many of the teams being sponsored by local businesses. The Greenie League is co-sponsored by Greenville Little Leagues and Greenville Recreation and Parks Department. All Little League games are played at Elm Street Park, the Perkins Complex (Kiwanis & VFW Fields) and Guy Smith Little League Field.